This book illustrates and explains how to create an affordable underground house with far more advantages than an above ground house. Explains step by step planning, materials, construction, features, and some sample layouts to get you started. Along with much more. This is the book I plan to use when I build my house. The book ends by discreetly recommending a (DVD) series on design as the key element for success, and one that professional architects generally overlook (as we are all learning, the "experts" in finance and other areas are really "credentialed" but NOT experts). This is the best book I have read on alternative buildings. The author is very sensible about the whole project without being to much of a hippie. ....I HIGHLY recommend it! "I have fallen in love with this book because it is the answer to most of my greenhouse problems. I was concerned about building an above ground greenhouse due to the fact that I would have to run electricity to the building to heat/cool it. The earth berm concept is so painfully smart am left wondering why more people don't practice this? A must buy right now due to the need for sustainable living!!!!!!!!!!!!!!! The book covers the theory, design, and construction of the greenhouse (using Mike's low-cost PSP ---post, shoring, polyethylene--- technique): glazing, insulation and ventilation; beneficial critters and those that aren't so; solar energy input: the cold sink system; earth-tempering; and thoughts on how to use the completed structure. …. keep in mind that this greenhouse functions with no heat input in northern Idaho and carries hardier varieties through the winter. "This design is so unique and so efficient, this is phenomenal …. an amazing greenhouse system"
"An interesting, quite complete and entertaining book. The author gives the reader the benefit of many years of trial and error and some well-presented design elements that are not well treated in many other greenhouse books …. He got into greenhouse design choices and did a very nice job …. I liked the book. It was a pleasant read and the pearls of wisdom …. keep up the readers interest." "Every winter, gardeners dream of owning a greenhouse—a warm and sometimes sunny place to tend plants and overwinter tropical favorites. If high heating bills have kept you from realizing that dream, this may be the book that inspires you to dig right in. The author lives in an earth-sheltered home and grows his own veggies in a working greenhouse that is heated by the sun. In chapters about glazing, insulation, heat tubes and pest management, you'll learn the basics of a solar-powered greenhouse and be treated to plans, photos and random notes about the process, including the use of rabbits as part of the growing cycle. The solar heat idea will work best if you have a hillside and sunny location, but you can harness the sun anyplace there is light and soil. The author also wrote "The $50 & Up Underground House Book" and his home has been featured on HGTV and in various magazines. Even if you never intend to grow a thing, the book is a fascinating look into the mind of a modern day rebel." 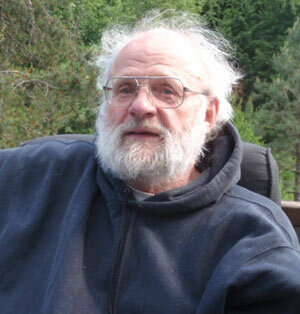 Mike Oehler (1/2/1938 to 2/2/2016) -- our founder, an innovator in self-sufficient living and the man who literally wrote the book on earth-sheltered housing for two generations of underground builders. His family will continue this website and sales of his popular books and training materials, and a memoir just completed by Mike of his days in the vanguard of the hippy movement of the 1960s and '70s will be released soon as well. In the winters of '72-'74, he hitchhiked around the States with his dog Bummer doing free-lance lectures at colleges and high schools on both underground housing, sponsored by architecture departments, and the back-to-the-land movement, sponsored by student environmental groups. The AP did an article which ran nationwide in 1977, and in succeeding years HGTV came to shoot a segment on his houses as have TV crews from the Netherlands, Greece and the BBC (twice). In 1983 a Dutch alternative magazine sponsored a lecture/workshop tour of Holland, Belgium, Germany, England and Scotland. Later in the '80s, Mike spent a couple of winters touring the U.S. by car conducting workshops on the design and construction of underground houses, shelters and greenhouses. But those were the Reagan years and all alternative lifestyles were falling out of favor. Even so, he did numerous TV and radio interviews along the way. In '92, Mike hired a videographer to shoot both his completed structures and of Mike giving a workshop with scale models of the "Thirteen Approved Methods of Design" for getting light air and views - windows -- into houses, which are totally underground. He'd make the attendees, or viewers, design five U houses of two to five rooms each on north, south, east and west slopes, and one on flatland; and make them design so that each and every room in those houses had windows from all four sides, with the idea that when they designed their own houses later, they had the tools get windows in from at least two sides in every room that matters. Each room would thereby have the highly sought after "corner office" effect. This is part of his 3-DVD set available for sale. During his 47 years on his Idaho homestead, Mike also pioneered a radically new greenhouse design. It takes tomatoes into the second week in December year after year, and hardies like kale and cabbage clear through the winter. True, they're not still growing in January, but they're still alive and edible and this is achieved without any other heat source than sun and that stored in the earth. It is also achieved in an area in which there is little winter sun and which is at 2,000-foot elevation on the Canadian border. Thus he wrote about this in The Earth-Sheltered Solar Greenhouse Book, which that titanic publishing empire, Mole Publishing Company, brought out in 2007. This book is a Nautilus Book Award Winner and well worth reading. Many radical ideas are met with resistance at first, often not gaining acceptance until after the death of the innovator, but the world and its inhabitants are in such a mess now, we believe underground housing, with the 23 advantages it has over conventional structures will be the housing of the future---if not before the earth cleansing cataclysms, then certainly after. Where are the traditional tornado shelters located? Where are the fallout shelters? Where does an army go to defend itself? In a world that is increasingly hostile, it’s really nice to know that Mother Earth herself is providing your safety. Please read Countryside Magazine's article on Mike Oehler's work. Click here. 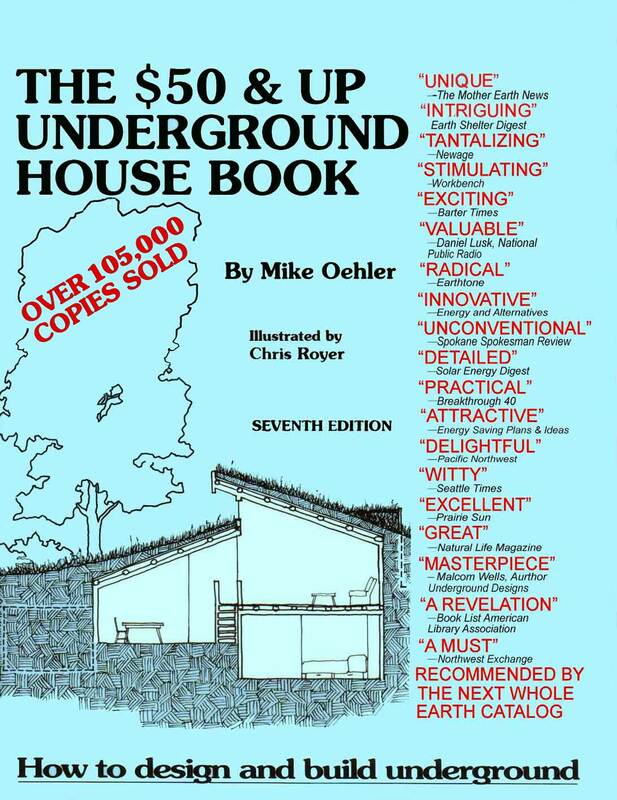 Learn about Mike Oehler's $50 & Up Underground House Book, or about the Underground Housing Video or DVD Set. Or use the menu at left for more information. Order using our online form , by mail or by phone. We know of nothing anywhere which comes even close to matching the wealth of knowledge found in this three-DVD, six-hour DVD set. The design course taught in DVD two alone is worth, we believe, a hundred times the cost of the set in the increased light, air and views it will afford your subterranean home, and in the home’s resale value. If you are just beginning to explore the option of underground housing, The $50 & Up Underground House Book alone will suffice. But if you are convinced you want to build below surface, or need more information to make up your mind, you need this set. It is valuable to owner/builders, self-designers, architects and contractors alike. This is the same course author and instructor Mike Oehler has taught for architecture departments at colleges and universities across North America and England, Scotland, Belgum, the Netherlands and Germany. He has the material down pat and is able to anticipate your confusion and questions. Unlike the live workshops, the videos allow you to study the material again and again and to share it with your family and friends. The first DVD explains the Post/Shoring/Polyethylene (PSP) method of building underground with the warmth and charm of wood. The secret is a layer of plastic which protects the wood from the damp of the earth. The original structure built by this method as an experiment in 1971 is still in service. Instructor Mike Oehler invented it, built it and lives in it today. He is now at work on the stunning PSP underground Ridge House with its twenty-mile views. The second part of the construction DVD is a slide presentation showing construction and completion of a number of underground homes built by this method. Construction costs can be as low as 1/10th the cost of normal construction -- sometimes even lower. This is the heart of the workshop. Using chalk board and the same scale models he hauled for years to universities across North America and Europe, Mike Oehler teaches his revolutionary methods of underground design. Rejecting for the most part the four common methods (the foolish four: skylights, atriums, vertical window wells and the disastrous first thought design) he teaches instead twelve methods which guarantee light, air and views from any and all directions of the compass in each underground room. No more dark, airless, basement-like underground buildings! As Mike likes to say, "An underground house has no more in common with a basement than a penthouse apartment has with a hot, dark, dusty attic." Students of the course actually design five underground homes during the screening of this DVD using the included copyrighted design kit. These hands-on excursuses not only drill the methods home, they are actually fun! Those who complete this course wind up with a better concept of underground design than the vast majority of practicing architects today. In the second part of this two-hour DVD, Mike takes you on a personal tour of the four underground or earth sheltered houses on his land. You see real life applications of the Royer Foyer, Hollywood Wings, Up Hill Patios, Basic Designs and more. This third DVD teaches how to build an astonishingly inexpensive shelter which can take your family and friends through nuclear fallout, tornadoes, hurricanes, raging fires and even earthquakes. After a catastrophe, if surrounding above-ground houses have been destroyed, it may be lived in and used as the starting point for an underground house. In normal times the shelter may be used for a root cellar, spare bedroom, workshop, tool shed or kids play house. The cost of this 12x12 shelter will run from $100 to $1500 depending on how many recycled materials are used and how much of the work the owner does. Comprehensive shelter diagrams are included at no additional cost. The second part of this DVD teaches how to design and build a spectacularly effective earth sheltered greenhouse. The prototype for this, invented and built on Mike Oehlers 40 acres in mountainous North Idaho, 30 miles south of the Canadian boarder, has been in service for nearly a quarter century. Without any other heat source than sun and earth this greenhouse takes tomatoes into the second week in December and hardies like cabbage and kale clear through the winter year after year. The greenhouse is resistant to the ravages of gophers, moles, deer, rabbits and most other plant predators. It can even collect its own irrigation water. A 10x30 greenhouse should cost between $200 and $3000 depending upon materials and labor. The third part of the shelter DVD continues the tour of the underground structures on Mikes land including the earth-sheltered greenhouse. Order now with our online form, or order by mail. The Earth-Sheltered Solar Greenhouse Book has 230 pages with nearly 200 illustrations, photos, diagrams, lists, charts and drawings. It contains all the information you need to struggle free from the pesticide, herbicide, fungicide, waxed, E-coli laden, genetically modified and irradiated supermarket produce. It promotes organic food grown in the closest local spot of all, your backyard. It does all this and saves you a bundle of money too! 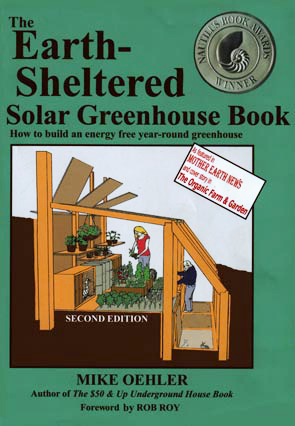 The Earth-Sheltered Solar Greenhouse Book details the benefits of both passive solar energy and earth sheltering in greenhouse design. This combination results in greenhouses which need no heating. The captured sun's energy and that which is stored in the earth is enough for successful year round harvest. Gone are costly heating bills. Gone is the squander of nonrenewable energy resources and the resultant atmospheric harm. This is because above-ground unheated greenhouses get natural heat at night from only one side, the floor. They lose heat from the other five sides. The properly designed earth-sheltered greenhouse is naturally warmed at night -- and in the winter -- from five sides and loses heat from only one, the carefully selected glazing. The ratio is exactly reversed. This book tells all. It takes you step by step through the construction of an inexpensive greenhouse which may be built with either newly purchased or salvaged building materials at great savings. It explains the author's unique Post/Shoring/Polyethylene construction methods which Countryside Magazine called “Revolutionary... innovative and ingenious... a totally different concept.” The book deals heavily with design so that the reader may custom-build a greenhouse perfect for the particular climate and needs. • What animals should be living in the greenhouse? Order the 3 DVD set for $95.00 plus $6 shipping and get The $50 and Up Underground House Book for less than 1/2 price: $9.95. Book ships free. Order the 3 DVD set for $95.00 plus $6 shipping and get The Earth-Sheltered Solar Greenhouse Book for less than 1/2 price: $12.45. Book ships free. Order the 3 DVD set for $95.00 plus $6 shipping and get both The $50 and Up Underground House Book and The Earth-Sheltered Solar Greenhouse Book each for less than 1/2 price. Both books ship free.